Happy Friday! Because I have been pinning onto my "Organization" board like crazy, I was inspired to share how I organize my bracelets, rings, watches, stud earrings and some miscellaneous items. The tray I purchased at the Target "dollar spot" for $2.50! I store my rings and brooches in these glasses of wine that were gifted to me. The other glass is a giant martini glass from Michael's where I put miscellaneous things (such as that fascinator from Forever 21 and my Rag & Bone Mickey Ears). On the tray I also put my perfumes and watch cases. 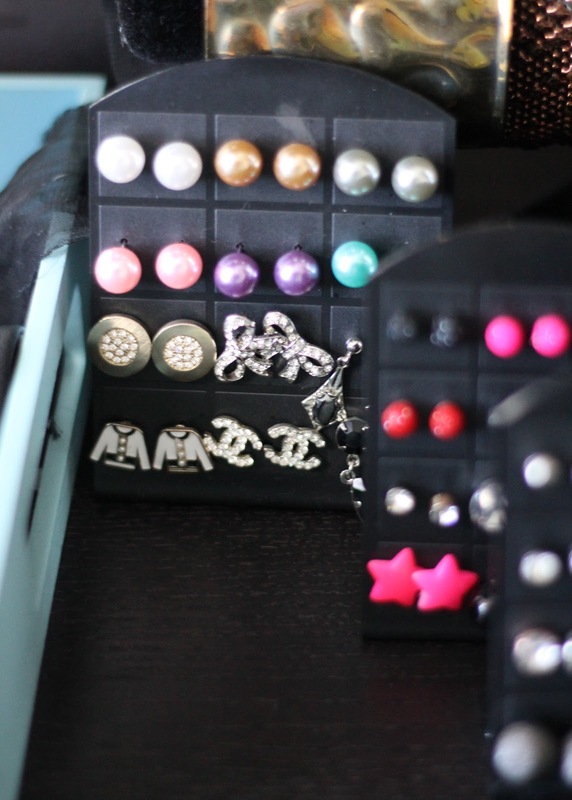 The earring holdings I found on a whim, at an accessory store where they sold their stud earrings on these stands. I used them to put some of my favorite stud earrings. The hanging earrings I have separately. The bracelet holders are 3 units that I purchased from Container Store (here!) on sale. Oh girl...I have everything everywhere! I LOVE how you have everything on display! So nice! I absolutely love how you've organized everything! Your earrings are too cute. So many accessories! I'm a sucker for organization posts so thanks for sharing today. Have a great weekend! 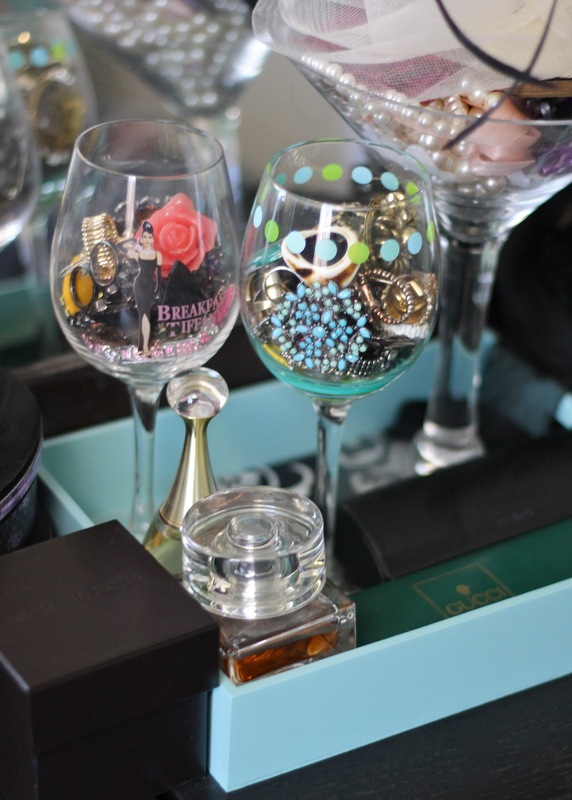 I love the idea of putting rings and things in wine glasses! Genius and super cute! This looks so good! your jewerly is perfect btw! I'm going to remember this to do! Love it. Super cute and practical. wow you have so many!! 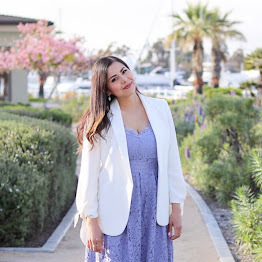 so many fab accessories! love the way that you organize them! Omg!! Jewelry/accessory organization is a constant struggle for me, switch it up almost weekly. You have inspired me, great ideas.